Grandparents play a tremendously important role in the lives of their grandchildren and grandparents can be a great source of love and stability for their grandchildren through the years. Texas courts recognize these realities and can order grandparent visitation in a variety of circumstances. If you are dealing with a grandparent visitation issue, either trying to establish a visitation schedule as a grandparent or seeking to address it through the court as a parent, there are many circumstances and factors you need to be aware of as you pursue this issue. 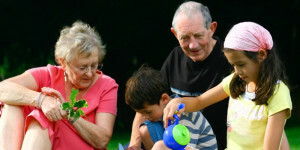 Grandparent visitation is not an absolute or automatic right and must be considered carefully by the Court where there are disputes on the issue between the parent(s) and the grandparent(s). A visitation and custody attorney can help you navigate these difficult situations. Speak with a visitation and custody attorney at K&M. If you are a grandparent caring full time for a grandchild or grandchildren, you may want to consider seeking formal, legal custody of that grandchild or grandchildren. We can help you with this as well. As the custodial parent, you may be entitled to financial support from one or both parents, since the child(ren) are residing with you. If you have any questions on this process, what your rights are as a grandparent or where to begin, please contact us. We are here to help you navigate the family court system and get you what you need and what your grandchild(ren) need, whatever that may be.